Attorney-at-Law Nagananda Kodituwakku has filed a complaint against three judges in the Supreme Court today for alleged corruption. Mr. Kodituwakku was suspended from practising law for three years by the Supreme Court last month. The suspension was carried out as he was found guilty of defaming the former appeal court judge, Vijitha Malalgoda. Below is the affidavit he submitted along with the complaint against judges before the Bribery Commission in Sri Lanka. 1. The Respondent Petitioner is the Respondent in the Rule matter No 01 of 2016 who will be hereinafter referred to as the ‘Petitioner’ and the Complainant Respondent is the Complainant in the said Rule Matter who was then the President of the Court of Appeal and now a judge in the Supreme Court who will be hereinafter referred to as the ‘Respondent’. 2. The Petitioner states that he is the only public interest litigation activist in the country who fights corruption against dishonest elements occupying public office in all three organs of the government (Legislature, Executive, Judiciary), which includes the office of the Attorney General (AG), three Commissioners of the CIABOC and its Director General (Commission to Investigate Allegations of Bribery or Corruption) and also the Bar Association of Sri Lanka (BASL). The matters initiated in the pubic interest since return to Sri Lanka from UK, are as follows. ** The Supreme Court on 25th February 2019 declined to issue a mandate in the nature of Mandamus against the CIABOC to investigate the deliberate abuse of public office by the Attorney General. The Petitioner will challenge the Supreme Court ruling by way of a Revision Application in due course. The Supreme Court had ignored the fact that the AG had conferred a favour to the Legislature by giving an illegal advice to postpone the Provincial Council elections defying the Supreme Court determination made on 08th Sep 2017. 3. The Petitioner states that because of his uncompromising stance of single-handedly defending the rule of law and the Constitution as per his obligations under the Constitutional Oath (4th Schedule to the Constitution) and Article 28 (a) of the Constitution to perform the public office as an Attorney-at-Law honestly and faithfully, he has earned many enemies in all three organs of the government and also amongst the dishonest elements in the legal profession. 4. The Petitioner states that the Rule matter was initiated further to a complaint made by the Respondent, a judge in the Supreme Court who has been charged for judicial corruption by the Petitioner. The Supreme Court has not allowed this case SC/Writs/3/2016 to be supported since March 2016. 5. The Petitioner states that the said Rule matter (SC/Rule/01/2016) was initiated by the Attorney General on 11th Aug 2017 and the relevant inquiry conducted by the Supreme Court was concluded on 18th March 2019 with an imposition of a 3-year suspension from legal practice. 6. The Petitioner states that the relevant charges leading to this Rule matter have been framed by the Attorney General who has also been charged for corruption by the Petitioner as referred to in paragraph 2 above. Most of these cases have not been allowed to be supported by the Supreme Court. 7. The Petitioner states that this Rule matter is related to an answer provided by the Petitioner in response to a question raised by the Respondent in the open Court on 21st May 2015. The Respondent, the then President of the Court of Appeal had rejected the Motion filed in Court on 20th May 2015 by the Petitioner seeking the transfer of a Writ Application (CA/Writs/83/2014) to a different Bench. The Respondent had decided to take on the matter for hearing by himself regardless of the request made for the change of the Bench. 8. The Petitioner states that consequent to an unpleasant experience (details of which are explained from paragraph 21st to 29 below) he had with the Respondent, the Petitioner had been compelled to submit a Motion with reasons fully explained and requesting the Respondent to appoint a deferent Bench for the cases, the Petitioner appeared. The Respondent had acceded to such a request made in the Motion dated 09th February 2015. (The Motion dated 09th February 2015 is attached hereto marked X2). 9. The Petitioner states that any information filed in Court becomes a public document and thus there was no necessity to place on record through Motions repeatedly about facts, the Respondent had prior knowledge. The Supreme Court has also expressed its view on the statements that would affect the public trust on the Judiciary and hence need not be mentioned in a Motion. 10. However, the Petitioner states that the Respondent in the second occasion on 21st May 2015, decided to take the matter (CA/Writs/83/2014) before him, whilst questioning the Petitioner in the open Court ‘Don’t you like my face?’ (ref: page 15 of the inquiry proceeding dated 15th May 2015 marked Y1). 11. The Petitioner states that thereby the Respondent pushed him into a situation where he was compelled to answer in the open Court ‘My Lord, I have no confidence in you’. And then the Respondent told the Petitioner that he would report the matter to the Chief Justice claiming that the said statement as contemptuous. 12. The Respondent has admitted to the above facts in his evidence given at the Supreme Court Inquiry held on 14th May 2018 (ref: page 11 of the inquiry proceeding dated 14th May 2018 marked Y1). a) “… There was a similar Motion filed in Court dated 20th May 2015 by the Petitioner requesting a different Bench be appointed to hear the matter CA/Writs/83/2014 …” (ref: page 11 of the inquiry proceeding dated 14th May 2015 marked Y1). “… When I opened the file I saw the said Motion dated 20th May 2015 …” (ref: page 11 of the of the inquiry proceeding dated 14th May 2018 marked Y1). 13. The Petitioner states that the reasons for seeking a different Bench without the Respondent is clearly explained in the paragraph 21 to 29 below. 14. The Petitioner states that on 21st May 2015 the Respondent referred the matter to the Chief Justice K Sripavan through the Registrar of the Court of Appeal with the following remark made on the case record. 15. The Petitioner states that on 25th May 2015 in response to the said complaint, he too was compelled to report the matter to the Chief Justice K Sripavan through an Affidavit (ref: X10 and X11). 16. The Petitioner states that the Chief Justice took no action on the Respondent’s complaint and returned the case record (CA/Writs/83/2014) to the Registrar of the Court of Appeal. The remark made by the Secretary to the Chief Justice in the case record is reproduced below. 17. The Petitioner states that as mentioned in paragraph 5 and 6 above, the Rule matter (SC/Rule/01/2016) was framed by the Attorney General on a complaint made by the Respondent. The Petitioner states that he is strongly of the view that those who occupy public office in the Legislature, Executive, Judiciary, the Attorney General, CIABOC and who have been charged for corruption by him are apparently involved in this case to silence the Petitioner from exposing high profile government corruption. The Attorney General and the BASL got together to make it clear in the open Court on 24th Oct 2017 that the Petitioner should be charged for contempt for making corruption allegations against the Supreme Court judges. 18. The Petitioner states further that he was aware that there was an attempt to persecute him for fighting high profile corruption and therefore he had informed the Chief Justice on 18th June 2018 with a Motion filed in the Supreme Court [concerning the case SCRF/344/2017 initiated against the Attorney General by him] about the surreptitious moves to persecute him by the Attorney General, along with certain judges appointed to the Judiciary from the Attorney General’s Department. b) Both Complainant and the Attorney General are charged for Corruption: The corruption complaints made against the Respondent and the Attorney General on 15th Feb 2015 (marked X8) and 29th July 2017 (marked X29) respectfully are yet to be inquired into by the CIABOC. c) Supreme Court rejects the evidence that provides protection to lawyers fighting corruption: The evidence presented to Court on 14th of May 2018 concerning the Commonwealth Latimer House Principles and UN Basic Principles on the Role of Lawyers by way of a Motion was rejected by the Court further to an application made by the Attorney General. d) BASL deceives the Supreme Court: The Bar Association of Sri Lanka (BASL) On 15th May 2018 submitted to the Supreme Court that the International instruments referred to above (X22 and X23) had no application in the Republic of Sri Lanka, which is a deliberate lie. e) BASL surreptitiously redesigns its home page to deceive the Supreme Court to punish the Petitioner: The BASL, after dropping the Principle 16 of the United Nations Basic Principles on the Role of Lawyers redesigned the BASL Homepage to cover up the false statement referred to above. f) The BASL threatened the Petitioner for initiating corruption cases against the Judges in the Supreme Court: The BASL sends a threatening communiqué to the Petitioner on 01st May 2018, directly referring to the judicial corruption cases initiated against 6 Judges in the Supreme Court and warned of an impending punishment. (The communication addressed to the Petitioner by the President of the BASL dated 01st May 2018 marked X26 is attached hereto). g) The BASL defies it own Constitution to condone judicial corruption: The BASL failed to challenge the Attorney General when he defied the Supreme Court determination against the postponement of the Provincial Council Elections. This made the Petitioner to charge the Attorney General (SC/Writs/5/2017) to safeguard the independence and integrity of the Judiciary. h) The Chief Justice rejects the request for a fuller Bench and holds a partial inquiry: The request made by the Petitioner in terms of Article 132 (3) (iii) for a fuller Bench was denied and a partial inquiry was conducted into the charges leveled against the Petitioner. 19. The Petitioner states that, from the viewpoint of any reasonably prudent person, the inquiry conducted into the Rule Matter (SC/Rule/1/2016) had been patently biased and prejudiced. The supporting evidence is as follows. (Copy of the Motion dated 15th May 2018 returned by the Registrar marked X31 is attached hereto). b. Denying the Petitioner his right to legal representation: At the commencement of the inquiry on 14th May 2018, the Court denied the Petitioner the right to present his case through a Counsel violating the Article 13 (3) of the Constitution. c. Denying the Petitioner his right to lead the evidence of key witnesses for the defence: The Petitioner was not allowed to lead the evidence of the two witnesses (Professor Rajiva Wijesinghe and Ravaya Editor Victor Ivon) for the defence by the Attorney General. d. Denying the Petitioner to adduce affidavits given by the said key witnesses: The Petitioner was not even allowed to adduce the Affidavits of the two leading witnesses (Professor Rajiva Wijesinghe and Ravaya Editor Victor Ivon) (ref: X32 and X33). e. Permitting the Attorney General to make unfounded allegations against the Petitioner and denying the Petitioner of his to right to rebut: Attorney General was allowed to make absolutely unfounded allegations against the Petitioner at the hearing that he was a British Agent who has come to Sri Lanka to destroy people’s trust in the Judiciary yet the Petitioner was not permitted to counter the said allegations with evidence already filed in Court. f. The Court proposing a settlement in the midst of the trial: On 13th March 2019, whilst the Petitioner was making his oral submission he was stopped by the Court. And after a lengthy discussion amongst them, Justice Sisira de Arbrew proposed to the Petitioner to go for a settlement by making an apology to the Respondent. The Chief Justice Nalin Perera told the Petitioner that he did not wish to proceed with the inquiry as he was retiring soon and both Justices informed the Petitioner that they did not wish to proceed with a matter but to resolve it. g. The Court inducing the Petitioner to make an apology: The Court surreptitiously induced the Petitioner to make an apology to the Respondent in writing after which the Bench withdrew. i. Petitioner tendering his apology to the Respondent in the open Court: On Monday the 18th March 2019, when the matter was taken up, the Respondent was summoned in Court and the Petitioner was directed to tender his apology. The Respondent accepted the apology and with the permission of the Court left the Courtroom. j. The Attorney General intervening in the Court-induced settlement: Thereafter the Solicitor General, Dappula Livera, intervened and informed the Court that despite the apology Petitioner should be punished for the alleged contemptuous statement and also for making unfounded allegations against the Respondent. Apparently the Solicitor General was referring to the corruption case (SC/Writs/03/2016) filed by the Petitioner against the Respondent. k. The Court failing to honour its own terms of settlement. The Court then completely negating the Court-induced settlement of the Rule matter, permitted the Solicitor General to raise objections against the settlement and also to make references of corruption allegations against the Respondent, which had nothing to do with the Rule matter, which was already resolved on the day with the Court ‘s intervention. l. The Petitioner making his stand clear on the apology: The Petitioner then informed the Court that the Court-induced apology has nothing to do with the corruption allegations made against the Respondent and his apology limited only to the answer (‘My Lord, I have no confidence in you’) given by him on 21st May 2015 further to the question ‘Don’t you like my face’ posed to him by the Respondent. Further that the corruption charges made against the Respondent remain unchanged with the evidence already recorded in the Court. m. The 3-Judge Bench abusing the Court-induced inculpatory statement, to penalize the Petitioner: Then the Court adjourned the proceedings and returned at 01.30 hrs Justice Prasanna Jayawardana read out the judgment, which went on to state that the Petitioner was found guilty for the Rule matter and therefore suspended from legal practice for a period of 3 years. n. The flawed Judgment further stated that the Petitioner had expressly and unconditionally withdrew the allegations he had made against the Respondent. The Petitioner never withdrew the corruption allegations made against the Respondent and therefore the judgment is manifestly false and unfounded. 20. Eyewitness evidence: The Petitioner states that an Affidavit furnished by two members of public who were present on both days of the inquiry (13th and 18th March 2019) is filed in Court along with this Petition. This evidence vividly illustrates what had exactly transpired in the Courtroom. 21. Petitioner states that the case CA/Writs/434/2014 was filed on 15th Dec 2014 challenging the nominations of the former President Mahinda Rajapakse for a 3rd term (ref: page 32 and 33 of Y1) seeking an interim relief suspending the elections until the matter is heard and determined. 22. The Petitioner states that considering the urgency of the matter he was seeking permission to support it before the Court vacation due on 20th Dec 2014. However, the case record strangely went missing and the matter was not listed for support. 23. The Petitioner states that the Registrar of the Court giving evidence in the Rule matter (SC/Rule/1/2016) on 15th May 2018 stated that the Registry would not accept a case for registration unless a Petition, an Affidavit and a Motion are duly filed in Court (ref: page 22 of Y1). Therefore, the Petitioner states that there was no reason for the registered case record to go missing. 24. However, the Petitioner states that the case record reappeared at the end of the month of December 2014 and it was fixed for support for 2nd Jan 2015. The Petitioner states that the Attorney General hand-delivered a letter at the Petitioner’s residence on 01st Jan 2015, a practice which had never been adopted by the Attorney General (ref: page 32 of Y1). 25. The Petitioner states that it was strange that the file (Writ Application No. 434/2014) went missing at a time the then President Rajapakse was confident of winning the election and reappeared when the opposition led by the candidate Maithripala Sirisena who posed a formidable challenge to President Rajapakse. 26. 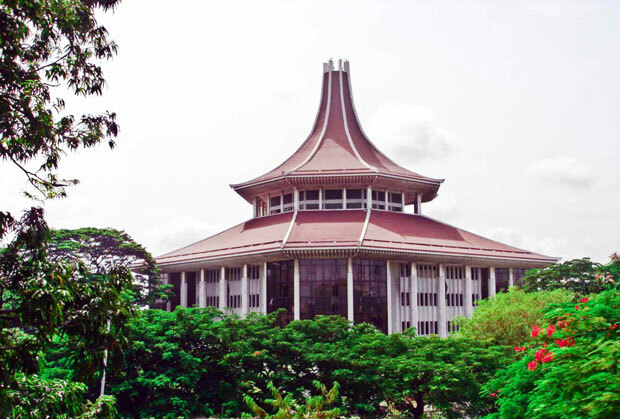 The Petitioner states that in his evidence given on 15th May 2018 he stated that there were numerous requests from many concerned citizens (including Ravaya Editor Victor Ivon and Professor Rajiva Wijesingha ref: X32 and X33) urging the Petitioner to withdraw the case claiming that the Presidential Election would be postponed with an interim relief prayed for was granted. This would have allowed Rajapakse regime to remain in power. Therefore, honoring the popular request, the Petitioner filed a motion dated 02nd Jan 2015 in Court withdrawing the Petition with the reasons fully explained (ref: page 32and 33 of Y1). 27. The Petitioner states that disappearance and reappearance of the case record (Writ Application No. Writ/434/2014) would not have happened without the knowledge of the Respondent who was the President of the Court of Appeal at the time. The Respondent has been appointed by the Mahinda Rajapakse regime in spite of heavy criticism from the then President of the Bar Association (ref: X6) (ref: page 29 of Y1). 28. The Complainant judge himself in his evidence given in Court 0n 14th May 2018 revealed as follows about the disappearance of the case record, which could never have happened without his involvement in the loss of the case record in the first place. 29. The Petitioner states that he had lost the confidence in the Respondent after this experience concerning the case No Writ/434/2014. 30. The Petitioner states that in his evidence he also stated that the Respondent’s conduct concerning the case (CA/Writs/434/2014) was an unlawful favour afforded to the then Executive President enabling him to stay in office unlawfully. Such conduct is a punishable offence under the corruption law and therefore he was reported to the Bribery and Corruption Commission (CIABOC) on 15th Feb 2016, for the abuse of the judicial office for improper purposes. 31. The Petitioner states that he has charged the Respondent along with 4 other Supreme Court Judges for judicial corruption before the Supreme Court. The Respondent was charged with irrefutable evidence presented for conferring unlawful favours to the then Executive President. 33. The Petitioner therefore states that the order made by the Court marked Y7 is manifestly flawed as much as the said Order has been made per incuriam. 34. The Petitioner states that there are precedents, where it has been held that the Court should exercise its power of inherent jurisdiction to rectify errors, in similar circumstances as in the Petitioner’s case in the interest of dispensing of justice. i. Is it a case, which comes within the scope of the inherent powers of the Court? ii. Is it one in which those powers should be exercised? The attainment of justice is a guiding factor, and an order made on wrong facts, given to the prejudice of a party, will be set aside by remedying the injustice caused. b) In the Revision Application [SC 209/2007 (FR)] made by the 1st Respondent, P.B Jayasundara, who had been found guilty by the Supreme Court for abuse of office held in trust, and paid a sum of Rs 500,000.00, being compensation to the state, it was held inter alia as follows. “While our hierarchy of courts is built on an assumption of fallibility, with one, two or sometimes even three rights of appeal, as well as the often used remedy of revision, being available to correct errors that may occur in the process of judicial decision making, in the absence of such a review mechanism, the remedy provided by Article 126 is fraught with the danger of becoming an “unruly horse”, and for this reason has to be exercised with great caution”. This Court has generally displayed objectivity, independence and utmost diligence in making its decisions and determinations, conscious that it is fallible though final. The decision of this Court in the Fernandopulle case stressed the need for finality, and very clearly laid down that this Court is not competent to reconsider, revise, vary or set aside its own judgement or order (in the context of a fundamental rights application) except under its inherent power to remedy a serious miscarriage of justice, as for instance, where the previous judgement or order was made through manifest error (per incuriam). The remark made by an Attorney-at-Law names Srinath Perera published in the social media is reproduced below. The Other one manage by UPFA gave a wide publicity to the Court induced inculpatory statement with Chief Justice image published to affront the Petitioner in the public eye. 36. The Petitioner states further that the said inappropriate act committed by the Bench of 3 judges in the Supreme Court including the Chief Justice was intentional and it has paved the way for all print and electronic media (local and foreign including the BBC) to give maximum publicity undermining Petitioner’s integrity and honesty before the public eye, for no fault committed by him. 37. The Petitioner states that on 27th March 2019 he had to attend the Supreme Court as the Respondent in the SC/Rule/03/2017 before a Bench comprising of Chief Justice Nalin Perera, Justice Prasanna Jayawardana and Justice Dehideniya. The Petitioner states that he had to express his regrets over the abuse of the Court-induced inculpatory statement to impose a 3-year ban from legal practice by the Bench of 3 judges comprising of Chief Justice Nalin Perera, Justice Prasanna Jayawardana and Justice Sisira de Arbrew in the Rule matter (SC/Rule/1/2016). 38. The Petitioner states that in view of the foregoing, it is clear that there has been a grave miscarriage of justice caused to the Petitioner. Therefore, the Petitioner states that there exists a just and reasonable cause for the Court to exercise its inherent power to intervene and revise the Order made by the Court in the case SC/Rule/1/2016 on 18th March 2019. 39. The Petitioner, reserves the right to furnish any further material as the Petitioner might be able to obtain including the certified copies, which may pertain to the aforesaid matters but not currently available in further proof thereof. 40. The Affidavit by the Petitioner is appended hereto in support of the averments contained herein. 41. The Petitioner states that he has not invoked the Jurisdiction of the Supreme Court previously in respect of the matter pleaded herein concerning the Rule Matter SC/Rule/01/2016 and pleads all marked documents attached hereto be deemed to be part and parcel hereof.